Bridges to Prosperity provides isolated communities with access to essential healthcare, education and economic opportunities by building footbridges over impassable rivers. Bridges to Prosperity envisions a world where poverty caused by rural isolation no longer exists. We educate. We provide educational programs that teach footbridge construction to reach the greatest number of people in need. We innovate. We develop, continually improve, and share engineering solutions that are safe, replicable, and locally viable. We inspire. We provide opportunities for leadership development and personal growth through international collaboration. We prove it. We measure our success by the long lasting impact our projects have on the reduction of rural poverty due to isolation. Bridges to Prosperity was founded in March 2001 when Ken Frantz saw a photo in National Geographic magazine that showed a group of men trying to cross a broken bridge. Ken learned that his brother, Forrest Frantz, had seen the photo as well, and was equally moved to action. 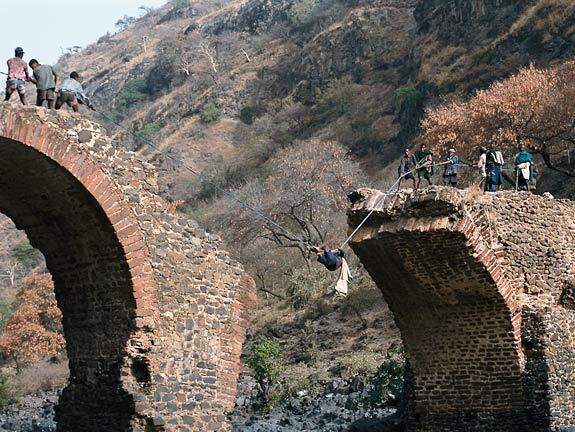 With the support of family and friends, Bridges to Prosperity was formed and shortly thereafter, the first bridge was built over the Blue Nile in Ethiopia. Bridges to Prosperity’s Zoe Keone Pacciani and Chris Rollins later received training from Hevetas, a com- munity bridge building program in Nepal. Hevetas’ footbridge construction uses a cable suspension design manual originally developed by Robi Groeli, and this manual is the foundation of the Bridges to Prosperity program. All technical sources that we use can be found at the link above from the Bridges to Prosperity corporate website, including manuals, computer modeling, training modules, and more.